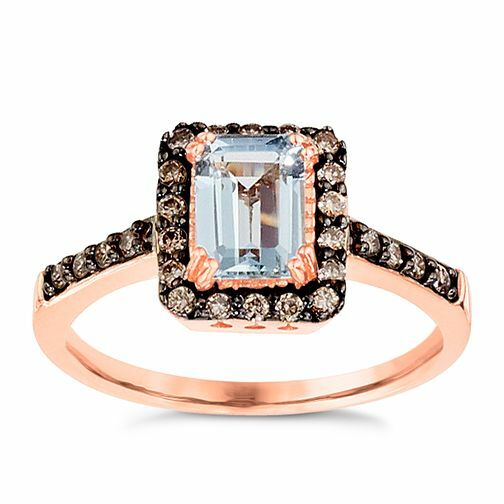 Le Vian 14ct Strawberry Gold Aquamarine Ring is rated 4.9 out of 5 by 10. Rated 5 out of 5 by Anonymous from Stunning This Ring looks Even better, on. Than in the photos. I have the Strawberry 14 ct Gold . Chocolate Diamond & Sea Blue Aquamarine Ring. It is a lovely colour not like some Aquarmarine,s Also I Love the fact ,That they make a wedding ring. Same shape to enhance it. Rated 5 out of 5 by Anonymous from Beautiful ring This ring has an old world Art Deco feel to it. Very beautiful and has lots of comments. Also bought the band which enhances it.